Little Mountain Music supplies quality musical accessories and teaching aids to acoustic musicians, schools of music, string teachers, retail dealers and distributors worldwide. We are located in Perry, Ohio, a small rural community located on the south shore of Lake Erie between Cleveland, OH and Erie, PA. All products we manufacture are proudly Made In The USA! BowMate, product of the month in The Strad Magazine November 2013 issue. In 2005 a good friend and well known area fiddler, Ray Sponaugle came to my music shop and had handmade a Violin bow rest that helped him with bowing comfort. It was carved from hard maple and glued to his bow with a soft leather covering. We decided to invent a molded version that could be easily attached and removed from a Violin or Viola bow. It took years to get the complex injection mold made and samples produced. 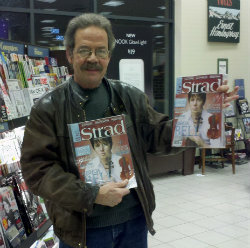 We sent thousands of samples to schools of music and individual string teachers to try out and provide some feedback. A few months later we were contacted by Isabel Trautwein, a Cleveland Orchestra Violinist who was starting up a volunteer program to teach area youth Violin, Viola, Cello and Bass Violin in an after-school setting at The Rainey Institute (El Sistema@Rainey). From the website: "El Sistema “the system” was founded in Venezuela to provide children the opportunity to learn music and to play in orchestras. The program emphasizes community-based orchestra training from a young age, with a focus on making music fun, and inspiring young musicians with a passion for music and for life". Isabel had learned of the BowMate from a string teacher at the Cleveland Music Settlement, a program we had provided samples. Isabel quickly found it was also a great teaching aid. Teaching correct bow hold and control of the bow is a very difficult and time consuming process. Only then did we realize the BowMate was more than just a comfort device. It was teaching kids in minutes rather than days or weeks, a proper bow hold. It quickly spread to public, private and charter schools all over the world.